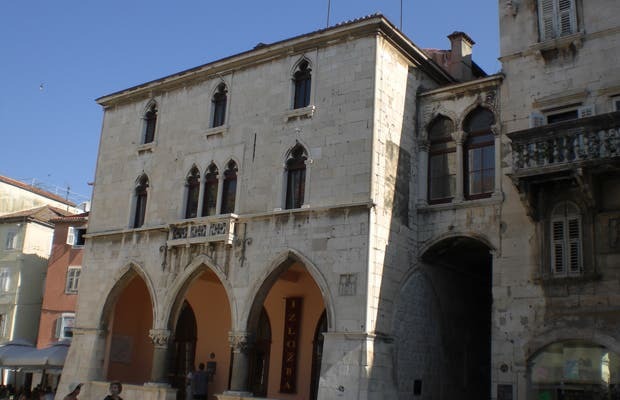 The Gothic-style Old Town Hall is located in Narodni Square outside the walls of Diocletian's Palace. It is the only remaining part of a complex that was destroyed in 1825, which once included the Rector's Palace, the theater and the city jail. The building was renovated in the neo-Gothic style in 1890. Between 1910 and 2005, it housed the ethnographic museum, but today the palace is used for temporary exhibitions of works by the city's painters, as well as events. It's a three-story building and, in the days when it housed the town hall, the highest levels were given over to administration.